I don’t know if every newbie author goes through this, but I sure did. I’m talking about Book Signing Anxiety (BSA). FIRST book signing anxiety. What do I say to people? What should I write? How should I sign my name? How much should I charge for a book? How much change should I have on me? How do I keep track of money and receipts? What pen should I use? What should I wear? Did I leave the iron on? And the mother of all questions—Will anyone show up? Now, I feel my first book signing may have been a bit overambitious. BookCon 2016. THE book convention of the year. If I were self-published, I never would’ve imagined attending since it is crazy expensive. Much respect for those indie authors who did attend and exhibit. 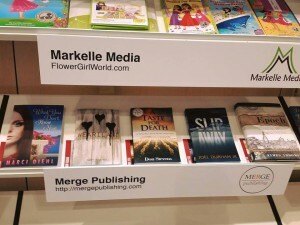 However, being published with Merge Publishing, I was able to have a spot on a shelf in the Independent Book Publishers Association, and a time slot for signing at a reduced cost. Fortunately, my signing occurred on the day the fans were allowed to peruse the floor. And what an experience. I showed up at 9:45AM, 15 minutes before the doors opened to the public. Hundreds of teens and their parents waited anxiously at the entrance. I walked around, looking at the various booths—Ingram, BookBub, Harlequin, Disney, Harlequin-Disney (not real, but I’m sure that would be interesting to someone). I made it up and down three aisles or so, seeing the stacks of books people were setting up. What I didn’t notice were prices of books in most booths, but I kept walking, taking everything in. Then Moses held up his staff, parting the sea. The flood of teens whooshed through the aisles and formed waves around booths. They were methodical in their madness, racing to the signings according to the printed schedule. I met up with my publisher and we found ourselves in line for a signing. I figured, why not. My signing wasn’t until the afternoon. Staff worked the space around the booth, corralling the line, getting readers to join, and passing out books. Some looked like they worked boxing matches, carrying the current book being signed above their heads and circling the aisles. Passing out those books. FOR FREE. Stacks and stacks of books. FREE. Let me reiterate what I said there. FREE BOOKS. I’m talking hardcover, own it before it even hits bookshelves, FREE. I made it to the front of the line, was cheerfully greeted by the author, and she signed the book. Just like that. And that is how I turned into a teen for the day. I walked up and down the aisles, seeing what books were given away at what times. I even did a ten push-up challenge to select a free book. If I met the author, I let them know about my book and tried to network. I did pass some booths that sold books. Those were the emptiest ones. It dawned on me what I had to do. There would be no selling of Weariland at BookCon. The best way to get the book out there was to give it away. Take the financial loss and hopefully gain some fans. My signing time arrived. I got out my archival pen (want my signature to last, dammit), and sat next to my publisher who shared the table with me for his signing. The thought crossed my mind. What if no one even wants a free copy? Within seconds we had interest, and interest begat interest. I even had one girl so excited about the book she called her friend and told her to rush over to our booth. We had 30 minutes, and it whizzed by. You know when people say they planned and planned for their wedding, then the day arrived and it happened so fast, in a blur? Those 30 minutes. I opened the first book, my hand shaking, and hastily wrote a message and signed my name. Book after book I signed, becoming more relaxed, and chatting with the friendly readers. They were so genuinely excited about the book, and grateful to meet with the author. I don’t think they realized how appreciative I was of their enthusiasm and kindness. It was such an adrenaline rush. I left Chicago with a different BSA, Book Signing Addiction. How many days to my next signing? Living in South Africa: Don’t share anything! Mary, I am so very happy for you. This sounds like it was quite the adventure! I know that each and every one of them will enjoy the story that unfolds in Weariland and they will share their love of it with their friends. Congratulations on your first (of many!) book signings!